With applications for the next edition of the RCSEd Diploma in Mountain Medicine (DiMM) due to open on the 1st May 2019 it seems to right to look in a bit more detail at what this diploma entails as well as reviewing Module 2, the second residential module. In brief, the full diploma consists of 8 modules, taken over a minimum of 2 years. The first 4 modules are residential and completion of these leads to a postgraduate certificate as well as a UIAA/ISMM/ICAR diploma (International Climbing and Mountaineering Federation and their associated partners, the International Society for Mountain Medicine and the International Commission for Alpine Rescue), which accredits similar programmes around the world. Completion of the 4 further diploma level modules (studied online) leads to a postgraduate diploma. Module 1: Theory 1-Plas Y Brenin, North Wales. 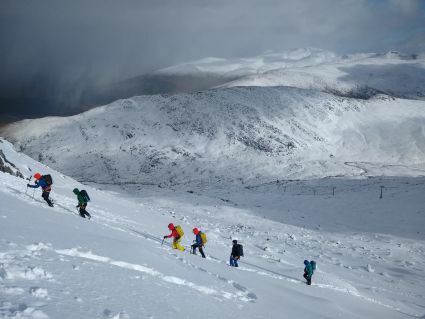 A 6-day course split into two parts,’ Physiology and Mountain Medicine’ and ‘Mountain and Wilderness Emergency Care’. This course was a combination of lectures, small group workshops and some outdoor sessions including navigation and casualty care. Summative assessment occurred during the course consisting of a primary survey on a simulated casualty and post course essay style exam questions (2x2000 word essays). Module 2: Mountain Skills 1-Highlands, Scotland. A 6-day course based in the Highlands of Scotland. Much more practical than module 1, all 6 days are full hill days covering a variety of winter skills and introducing more technical rope skills relevant to rescue scenarios. Another 6-day course, this time with more of a focus of travel medicine with summative night navigation assessments and post course essay exam questions. 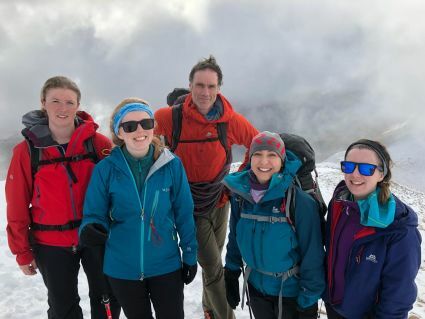 This 5-day course brings it all together and includes both mountaineering and medical skills in an alpine setting. The amount of work per module should not be underestimated with each have a considerable amount of pre-course reading (150 hours word per module estimated) and tasks to complete both pre and post residential modules, as well as time to complete the modules themselves. I have just completed Module 2 in Scotland, a very enjoyable week and it was a privilege to be taught by and spend time with people at the very top of their game. It was a very inspiring week and I’m already planning my next adventures. Below is a day by day breakdown of what we got up to to give an example of what one of the residential modules entails. It was great to see fellow mountain medics again, the majority of us had previously met at module 1 a few months previously, as well as meet a few new faces who had started the diploma at different times, an enjoyable dinner and evening in the bar followed whilst catching up on a few months’ worth of adventures. The day started as every day would start subsequently with a 7am breakfast and 8am briefing, we were soon off the hills. Today in groups of 4 to one instructor and a member of medical faculty for a day of foundation winter skills. Scotland has had a funny year weather wise and the week before we arrived saw the warmest February on record and a lack of any meaningful snow. However, our guides experience showed through and all groups descended on Stob Coire nan Lochan in Glencoe. Our group practised skills whilst ascending/descending Broad Gully (I) and a medical scenario reminded us of the importance of a slick primary survey and the added considerations needed when dealing with a casualty in winter. Tim Neill gave an inspiring evening talk of his various winter climbing exploits. The search for snow continued and fortunately our snow dances were answered with a good fall of snow overnight. 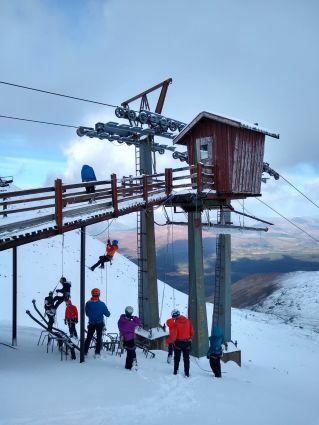 Today we took advantage of the gondola at Nevis Range and went to the East face of Aonach Mor to get to grips with some more technical rope work aspects and to lay the foundations of crevasse rescue skills, an essential component of Module 4 to take place in the Alps subsequently. I think I actually saw some sun this day, even if it was only for 5 minutes! This was followed by a sobering talk from Lochaber mountain rescue member Jon Hart on experiences at UK avalanche incidents. Today enabled us to put some of our recently refreshed winter skills/rope skills into practice with a mountain journey. 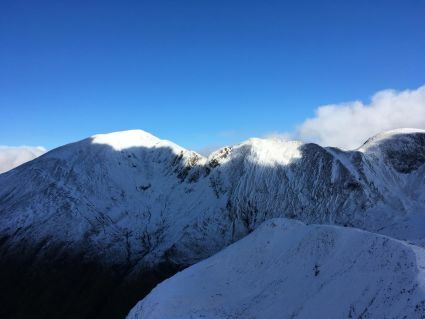 My group led ourselves up Schoolhouse ridge (I) in Ballachulish and other groups were based on Stob Ban in the Mamores. More medical scenarios were played through today, of increasing complexity. A hotly contested pub quiz followed in the evening, who would have guessed that a group comprised of medical professionals and mountain professionals would be so competitive! Navigation is summativley assessed during this module, an important skill for anyone wanting to work independently in the mountains, you do not want to become a liability when assisting a rescue team. This was done in small groups on Cow Hill above Fort William and was interrupted with the most complex and involved medical scenario yet which had everyone thinking hard. Smaller groups today with people out individually or in pairs with an instructor to demonstrate they were competent on moving on ground on grade II standard or above, a requirement of the diploma. Curved Ridge (III) and Dorsal Arete (II) were popular choices for this with Tower Ridge and Hidden Chimney (IV, 4) also completed. Today saw us descend on mass back to the Nevis Range at Aonach Mor for a series of simulated scenarios involving avalanches as well as the opportunity to get to grips with avalanche transceivers, probes and shovels. This day finished in a large scale scenario, another opportunity to pull together different aspects of the weeks learning. We experienced true ‘Scottish’ conditions today, even necessitating a run back to the gondola station which was in danger of shutting due to the high wind speeds! A quick sum up and it was time for everyone to head their own separate ways after another fantastic week. Next up for the majority of people is Module 3, this time back at Plas Y Brenin, North Wales, in May.